Enter Godspeed! Just...try not to look at his junk. Last night’s episode of The Flash introduced us to the show’s version of DC Rebirth villain Godspeed, also known as August Heart. 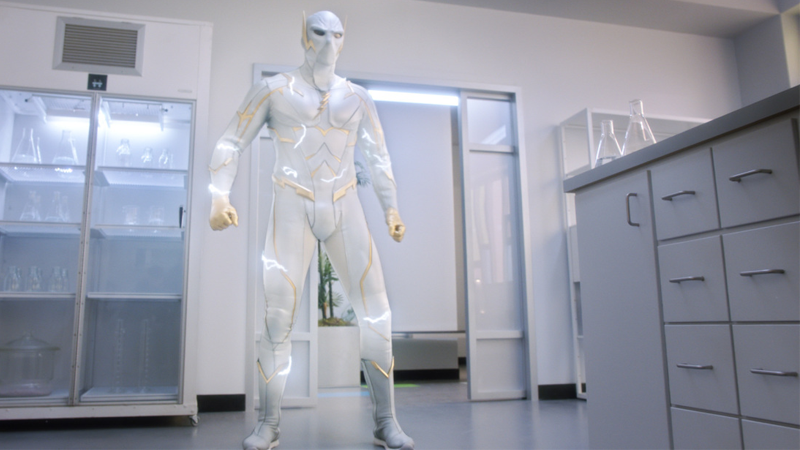 In the self-titled episode, Godspeed wasn’t a threat faced by Team Flash at large, but one that Nora encounters in flashbacks to her “present” back in 2049 (oy, this show and time travel) while working as a crime scene investigator. Godspeed quickly became the suspect of a chemical theft case Nora was tracking—and was actually a catalyst in Nora unlocking her own speedforce abilities. An encounter with him (and one painful, lightning-induced smash against a shelf later) disabled the power-dampening chip her mother Iris had secretly put in her daughter, to avoid her following in her then-missing dad’s footsteps after he seemingly vanished in the CW-DC-verse’s take on Crisis on Infinite Earths. And yes, really, although we don’t see August unmasked in the episode, the voice we hear coming from the suit is none other than beloved actor B.D. Wong, credited in the show’s opening—no stranger to superheroic TV, having recently played Hugo Strange on Gotham. But still, a lovely surprise, even if the rather comics-accurate costume still left a little to be desired at times. Much better in motion than it was in pictures, however. Also much better close up, where one can avoid the godcrotch. Although the episode concludes with Godspeed in jail—after Nora manages to trick him into briefly disabling his powers with some help from the imprisoned Eobard Thawne—with Wong lending his vocal talents to the villain, maybe Godspeed’s story isn’t quite as done as Nora thinks it is. Given the brewing family drama between her and Barry that ultimately sees Nora dumped back in 2049 by the end of the episode, there’s every chance Godspeed breaks out of prison and Nora has to face him again, with or without her father. Nothing like fighting a B.D. Wong-voiced-villain for some father-daughter bonding time, perhaps? We’ll have to wait and find out. The Flash continues next Tuesday, April 23.